Because of the great response I got from my Dragon Age Inquisition Instructable helmet build thread. 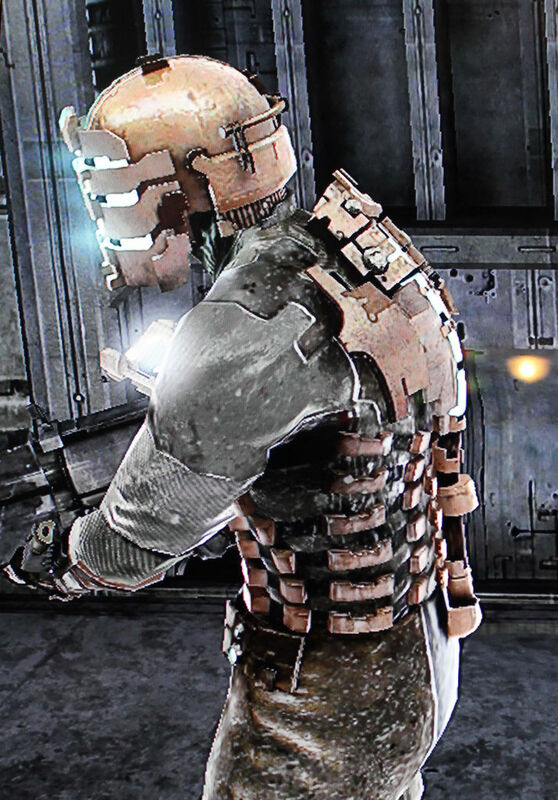 I have decided to make a full Instructible on my DEAD SPACE Isaac Clarke Level 3 Cosplay costume!!!!! Always wear eye protection, wear gloves, and use a respirator when needed. As with all of my prop builds reference material is key. When you start to think about making a prop from a video game, movie, etc. Always try and find as many reference images as you can. For this costume I actually played through the game back to where Isaac gets the Level 3 suit. I took numerous screen shots and posted them all over my basement wall for reference and inspiration. The great thing about having a game is you can rotate the camera around your figure to get a good look at every angel. Knowing that the RIG would be one of the most detailed parts I made sure to take lots and lots of pics. Because of the detail I want in this helmet I decided to make a junk mold. This is where you make a casting that you will refine and add your details to, then cast it again for the final product. These are great for sculpting and casting right off of them. Now they are designed for mask displaying so the scale is a little smaller than normal. Make sure to take that into consideration as you sculpt it out. This clay is awesome!!! It's easy to work with and will not mess with your silicone mold later on. Basically at room temp it is fairly hard (great for detailing). A heat source must be used to make it malleable. I have a small convection oven in my shop that I use to melt down the Monster Clay. Once the clay is soft I started applying it in small clumps to rough out the basic shape of Isaac's Level 3 helmet. Once the shape is pretty close I will use kidney tools to smooth out and control the surface. Remember it doesn't have to be perfect here we are just getting the basic shape to build upon. Once the clay is correct you want to make your silicone mold. You definitely want to wear eye protection, a respirator, long sleeves, and gloves from here on out. I like to use Smooth-On Rebound 25 for my jacket mold. You will want to apply this using chip brushes in 3 to 4 layers. The first 2 layers being the most crucial as these are your detail layers. Layers 3 and 4 are just bulking out the silicone so they don't need to be as pretty. You will also notice the plugs at the top of my helmet. Those are for the mother mold to be able to lock around the jacket mold. That will keep the silicone mold the shape you want. I made the mother mold out of fiberglass and used wing nuts to keep the 2 halves together. Smooth-cast 65D works very well for roto and slush casting. Once the blank is out, it is time for the Bondo and details to be attached. Bondo is applied in several thin layers to build up a base that can be sanded and filed to achieve the desired look. I purposely did not make it completely smooth because I wanted the pits and scrapes to show since he is supposed to be an engineer. I sanded it using a orbital hand sander that you can get from just about any hardware store. The line details at the top of the head were made by using pin files very slowly and very carefully. The final picture shows the helmet with the rib detail along the neck guard and the blocks sticking off the back and top. The ribs on the back were made by cutting styrene in small strips and gluing then to the bondo one by one. The blocks are balsa wood that has been sanded and glued into place. From here the entire helmet gets a couple coats of Krylon red primer and is wet sanded to make the raised areas smooth. The front faceplate was cut out of MDF, primed and molded flat. The plates get the curve by pulling them out of the mold before they completely cure and wrapping them around a metal trash can. Just like in Step 2 the process for molding is repeated using the Rebound 25 and Smooth Cast 65 D to get the final version of the helmet. From here you can see I attached the front face plate to the back half of the helmet using wing nuts and it is starting to look like Isaac's!! For the paint process I always use a self etching primer to prime the resin blank. This will allow the additional layers of paint to adhere properly. Once the primer has dried rattle cans are sprayed in very light layers 6-10 inches from the surface to pick up subtle variations in the reflective metallic paint. Krylon Metallics and Rustoleum Hammered metals are used one on top of the other. Once the base colors have been applied I will hand wash the entire piece with Liquitex Mars Black acrylic to "age" and "weather" the helmet. Then I will go back and dry brush Antique Copper and Silver Steele on the highlighted areas. Moving on to the face lights. Very thin plexi glass purchased from Hobby Lobby was cut to fit in between the plates. The back side of each piece was sanded to diffuse the glow of the LEDs. To light the plates I wired 24 5mm leds to 2 AA battery packs. Because I couldn't find the correct color I had to first sand then hand paint each LED aqua to match Isaac's signature glow. I cut 24 little brackets out of sheet metal to hold the LEDs in place and to make sure that they were pointing up at the plexi glass. A very small gap was left in the 2nd Plexi glass plate this is where I will be able to see out of the helmet. After the helmet I knew that the RIG was going to be the most time consuming piece. This is pretty much what you see the entire game since it is all 3rd person. I scaled out the RIG and made some paper templates before I transferred that to a thick piece of wonderflex plastic. With the basic shape cut out I started to heat form and curve the plastic to the shape of my back. To heat the plastic I used a heat gun from Harbor Freight. Tip: When using a heat gun the end of it gets crazy hot. I bought a 12X12 granite tile that I keep on my desk to place the gun on to cool off. Little bits and pieces of resin cast parts were assembled to make up the bulk of the details. Styrene was used to create the multi level look to the RIG shoulder blades. My most obscure and favorite part of my rig are the 2 knobs just down from the top plate. I just couldn't find a knob I liked. I racked my brain till I broke the part down and said it looks like a reece's peanut butter cup!!! I put one in the freezer, molded it in silicone and resin cast it. The best detail on the back! The lower part to the spine is a pex pipe from the plumbing department at Lowe's. I heat formed it using the gun and added styrene and resin cast pieces to the lower section. I cut the brace strip that was holding the shoulder blades together. That way I can counter sink the health tube so it looks like it sits into the back rig more. The health tube is made up of 3 layers of polymer tubing it will be wired with LEDs for effect. The clear tube is 5/8 the 2 frosted polymer tubes are 3/8 and 1/4 You can buy them from Lowe's by the foot in the plumbing department. The LEDs will actually slide down inside the innermost tube and should be diffused by the frosted outer layer. I also cut out the stasis gauge (cutting a circle in the middle of a finished styrene piece is not fun) but luckily it came out like I wanted. Most of the lower part is styrene with some plumbing couplers and a 2"cap. Once primed you can see that the details are really starting to stand out. I decided to take a break from the RIG and started working on Isaac's iconic Plasma Cutter. It hit me that between my actual job, filling Borderlands mask orders, and finishing the Dead Space costume I am going to be cutting it very close for comicon in March. So to try and speed things up I am going to mod a Nerf gun instead of building my plasma cutter from scratch. I don't really like doing this because I want it as accurate as possible. I might have to make one down the road but this will do for now. So here is the start of the plasma cutter build. I took apart a maverick that I had laying around. Next I cut out the blades for the front of the gun. This is the same material that I used to make the RIG. From here it was just cutting out the individual pieces and gluing them to my NERF base. The detail underneath the gun is a mixture of found objects, wooden dowels, and hand cut MDF. I also rolled a plastic front to house the LEDs and battery pack. What good would Isaac's gun be if it didn't have the 3 green lights :) After assembly damage was made by attacking the gun with a Dremel. Once the Plasma cutter was assembled it was time for some paint. Just like my resin cast helmet I use the self etching primer again as my base paint. Caution yellow was used on the "fins". Metallic rattle can paints were used to give the gun a good base coat then like the helmet a black wash was applied over the entire surface to make the damage pop. Copper paint was splattered on the metal to give it some more depth and a final spritzing of black was added to the front of the blades to simulate a burn. Silver acrylic was added to all of the highlighted damage areas. Moving onto the right arm and chest "rib" armor. The process for all of the armor pieces is pretty much the same. I start off by making a paper template to scale, then tracing the image to the wonderflex and cutting out the plastic. From there the plastic is formed by using the heat gun and a 6" PVC round pipe. Once the plastic has cooled it is glued and covered with EVA or craft foam depending on the thickness needed. The upper arm ribs are formed using a belt sander. The 54 mid section rib armor pieces are cut out using a utlity knife and are formed also using the belt sander. Battle damage was added using the Dremel and blasting it again with the heat gun. The foam is sealed using Modge Podge and is painted with a base coat using Krlyon black primer. The same metallic paints that were used is the helmet rendering are used again for the foam armor. The Rig was painted the same as the helmet and armor. Elastic was riveted to the rig so the the front chest piece and the back rig will balance each other out when worn. LEDs were again painted aqua and wired to a AA battery pack from Radio Shack with a toggle on/off switch. They were inserted into the spine and run over to the stasis gauge. Attached is an in game screen shot to real world side by side photo. The grey under suit was a 3XL it was pinned to my body size cut and sewed back together to fit. The fake leather chest and shoulder pieces were templated in paper then transferred to the cloth. The "leather" was sewn with a 1/4" bevel all the way round then the chest and shoulder pieces were attached together using heavy duty thread. Believe it or not this was the first time I have ever had to sew anything in my life :) The leather attached together in the back using velcro, which will be hidden by the Rig spine. The "ribs" are laid out then attached to the leather vest using epoxy and high temp hot glue. Underneath of the ribs 1" elastic is used for a visual aesthetic. All 8 pieces of the right arm armor is attached to the sleeve using 1/2" screws that are attached to the heat formed plastic. So the vest is now complete. The chaps are built in the same manner. The leather is constructed from a paper template, beveled, then attached to a pair of dark grey jeans. The chaps only go to the knees since he will have shin and knee guards. Velcro is again used to keep the chaps in place. The shin and knee guards are constructed out of EVA foam. The foam is rolled and heat formed then glued into place. Additional foam details are added to the back and craft foam is used as well. The armor is distressed using the Dremel and once again sealed using Modge Podge and primed using Krylon black. All Metallic rattle cans are used again to create the base coat of paint. All of the armor that is being used at this point is black washed and dry brushed by hand to achieve the desired battle worn look. The gravity arm piece is constructed using Wonderflex, EVA, and craft foams. The screen shots help devise a template to scale and it's just a matter of cutting out the pieces. Epoxy is used to make sure all of the pieces are secured. Behind the blades of the gravity stabilizer is a small tube that controls his ability to fly around. This piece is actually a Crayola marker that has been cut in half. Styrene pieces have been added for additional details. The stasis thrower in his palm is made of a resin cast plumbing coupler and a small circle of furniture foam. A single blue LED is placed behind the foam to diffuse the glow. The LED is attached to a 3v coin battery housing with an on/off switch. This is where I go to test fit the entire costume. From here I could see if the straps need to be let out or drawn in. This was the first time I had seen the entire costume together and I couldn't be happier with the results!! The entire costume took about 20 minutes to put on and I had to enlist the help of my wife. The other picture is of me behind my booth at Planet Comicon in Kansas City Missouri. It shows my wife helping me put on the DEAD SAPCE costume in front of a group of 40 fans, anxiously awaiting the final product. All I can say is "WOWWW"
Where can I find the 3xl grey undersuit? GTFO! This thing is stellar, kudos. I've wanted to do a dead space build for years but never got around to it. Seeing this has brought the inspiration back. Again, amazing job. Best outfit I have ever seen on here. Can you make a list of required materials and estimated cost? Also could I make this in a month? I always wanted to try an Isaac Clarke costume. This is unbelievable, good job! 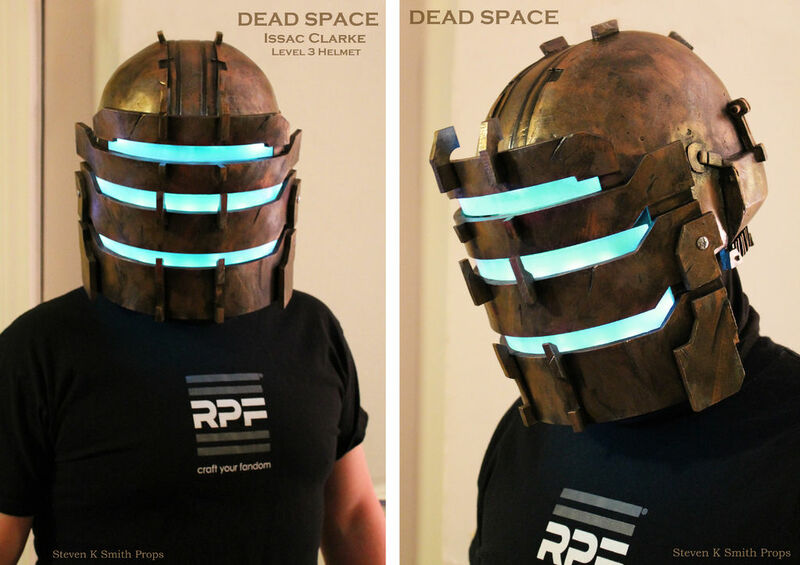 My brother and I were going Dead Space themed next year for H.O.T. Comicon in Texas. He was looking to make this exact suit, and we are getting materials as we speak! He is going as Isaac an I'm going as a monster from Dead Space two, the one with the arms coming out of its back and I was wondering I you can make a suit for that so I can get an idea for how to do it. I'm new to this and have no idea how to do it without constructions! Thanks in advance. Hey Steven Can You Make The Plasma Cutter From Scrap You Were Talking About? Congratulations for the win !